The company was founded in Reggio Emilia by brothers Adelmo and Rainero Lombardini in 1933, under the name of “Lombardini Fabbrica Italiana Motori S.p.A.”. Adelmo Lombardini had already been manufacturing combustion engines since 1922 with a company called “Società Anonima Cooperativa Metallurgica” of Novellara. Lombardini brothers mainly manufactured engines but diversified into finished products such as pumping sets. 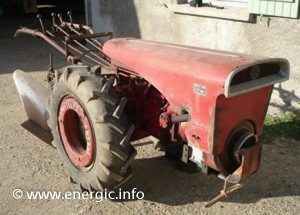 After World War II they increased the production of agricultural tractors and motoculteur engines. The company continued to expand and in 1963 bought a larger premises with additional land for a very large factory at Reggio Emilia. They continued on a huge expansion programme and eventually consolidated there manufacture into to just engines. Lombardini became the largest small agricultural equipment manufacturer in Italy at this time. Over this period Lombardini acquired its main Italian engine manufacturing competition; Slanzi, Cotiemme, Acme and lastly Ruggerini engine manufactures within Italy. They where purchased in 1999 by Mark 1V industries (a US auto components giant) and in 2007 by the Kohler company becoming part of there Power division (Kohler founded in 1873 by immigrant worker John Michael Kohler now employees over 32 000 people (2015) and is a US based corporation) . 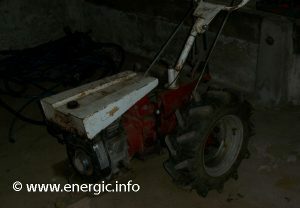 Energic 410 DA 120cv 377cc diesel lombardini. 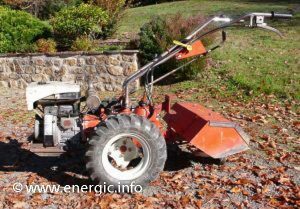 Read about Energic motocultuer 410 DA with Lombardini engine/moteur here. Read about Energic motocultuer 350 with Lombardini engine/moteur here. Read more about Energic engine/moteur supplier Bernard here. Read more about Energic engine/moteur supplier Sachs here.